A death/thrash metal band from Metairie, Louisiana. The band was made up of Francis Howard (guitar/vocals), Moyses Howard (drums), Andre Luiz (bass), and Luiz Carlos (guitar). The two Howard brothers are actually from Brazil, and immigrated to Louisiana. 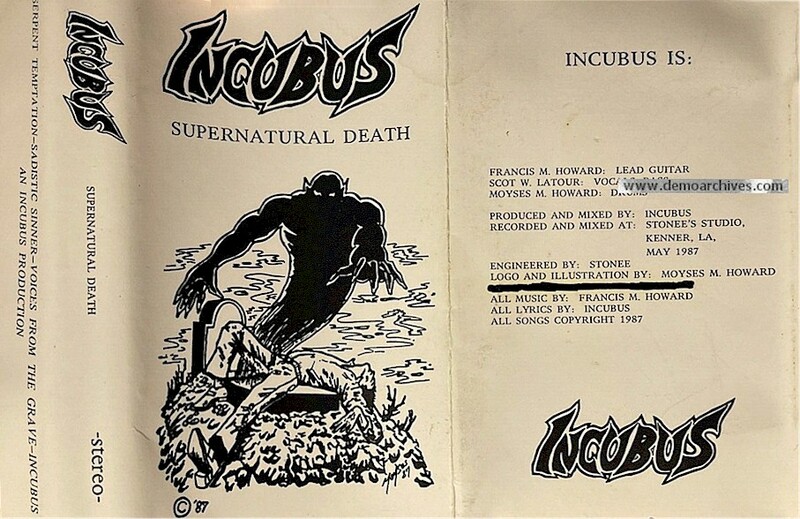 This Incubus has released one demo, and two albums, with one album being remastered and re-released with a different track listing. This band has changed their name to Opprobrium. Covers were plain black & white, not Xeroxed but printed on a white glossy paper, not too glossy though, but a real nice paper material. A total of 10 songs were recorded for this demo session. Rest of the track listing included Death, Hell's FIre, Caraleptic, Rigor Mortis, Blind Vengeance and Assault. It was released with 10 songs in it, but after the debut was released, they omitted 6 songs from and only left it as a 4 song demo for historical purposes for the fans. Both versions did not have lyrics. Tapes were regular cassettes with no info on them. The only difference between the 10 and 4 song demo is the tracklisting.